Part of the movie takes place in a beautiful beach, with a house surrounded by balconies. I can easily picture myself there, with a cup of hot chocolate and these marshmallows. Talk about a great way of spending a cold afternoon. Place gelatin in the bowl of an electric mixer fitted with a whisk attachment, add 1/3 cup (80ml) cold water and let stand for 10 minutes. 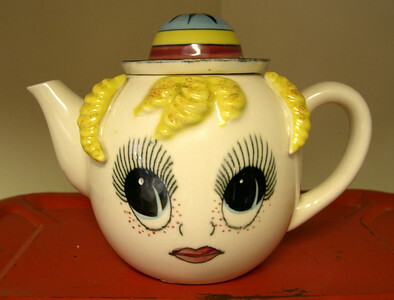 Combine sugar, corn syrup and 1/3 cup (80ml) water in a saucepan and stir over medium-high heat until sugar dissolves, bring to the boil and cook without stirring until mixture reaches 121ºC/249ºF on a sugar thermometer. With the mixer on low speed, add this syrup in a thin steady stream and whisk until combined. Scrape down sides of bowl, add vanilla, increase speed to high and whisk for 8-10 minutes or until thick, white and fluffy – I used a Kitchen Aid and in 4 minutes it was done. Sieve over the cocoa, whisk and transfer mixture to a baking paper-lined, lightly oiled 17cm-square cake pan*, smoothing top and stand overnight. Turn onto a lightly oiled cutting board and cut into squares – coating the knife with cooking spray or brushing it with oil helps a lot. Sieve together icing sugar, corn starch and cocoa, then roll marshmallows in cocoa mixture to coat. Marshmallows will keep for up to a week in an airtight container. These are so amazing! They look perfect with some hot mug of chocolate. Mmmm.... to both the marshmallows AND Richard Gere! I've wondered where that house is that it is not getting swallowed up by the ocean. It looks awfully close to the water in the movie! Who needs the beach? I'd curl up with some cocoa and those lovely marshmallows anywhere! I can't believe you made marshmallows Patricia! What a great and professional effort...they look delicious! Hee, you are such a girly girl Patricia :P Anyway, I applaud you for having the patience to make these, and so neatly too! (It's almost summer there, right? Or the other way round?) I imagine mine will come out in shapes of frustration! I've never entertained the thought of making marshmallows, but you've inspired me to try it. A chocolate marshmallow and Richard Gere sounds almost like too much heaven to handle! homemade marshmallows are pure bliss. If I can have some in front of me right now. Is the movie good? I am planning to watch it too. These are so pretty and look like something I could actually make. What is icing sugar? OMG Patricia these are amazing looking. I mean serious ga-ga drool here. These look SO good! Yummy! I've never attempted marshmallows, but I think it would be such fun to make for my grandchildren. I'll keep Richard Gere to myself, thank you very much! I love homemade marshmallows. As much for the fun of making them as the fun of eating them. But chocolate marshmallows made be the perfect food! fabulous. These look great! I still haven't tried my hand at marshmallows, but these make it very tempting. I love homemade marshmallows! Love the fun flavor! I love the photos that come with your recipes (not only this one, all of them). This will hopefully give inspiration to me for my blog, as I love cooking as well as photography but I combine them quite rarely.. I will come back here regularly, without any doubt ! Oh my goodness I've never tasted a chocolate marshmallow, but gosh do they look fantastic! Beautiful pictures and I am ultimate sucker for your marshmallows. They look inviting!!! I tried to make marshmallows before but when I started to whip up everything in the kitchen aid, the volume just did not happen!!! Can I put it down to the fact that I live above 6,000 ft above sea level or is that just a sordid excuse? ha! ha! I know it is the latter! I'm not a big fan of marshmallow. But I'm so tempted to put one into my hot coco!!!!! Oh my… those little marshmallows look so good. I have to get around to making marshmallows! These look so good, as does the hot chocolate. I have never made homemade marshmallows. You make sound so easy. They look gorgeous. Pat, those look so tempting. Especially in the Winter nights. Enjoy! And you are far too kind, my friend. Thank you. Mandy, it is good - I'm more of a drama girl, but I do like romance when the movie has talented actors, and this is the case. Pam, tks, darling! Icing sugar is confectioners' sugar. Tami, thank you for stopping by! Leonor, I'm glad you stopped by, tks! Zoe, thank you, darling! I can't wait to try other flavors. Sweet Bird, tks for dropping me a line! They are not hard to make, believe me! Leslie, thank you for visiting! Melody, homemade is always best, isn't it? 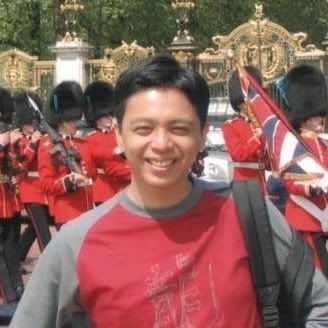 Andrew, thank you for visiting! Michael, I'm glad you find this inspiring, thank you for stopping by! Kelly-Jane, they were really good, my friend. Nazarina A., really? That's a shame! Don't let that keep you from trying again. As for the altitude, I do think it gets in the way, it's not an excuse! Julie, they are not hard to make, dear! 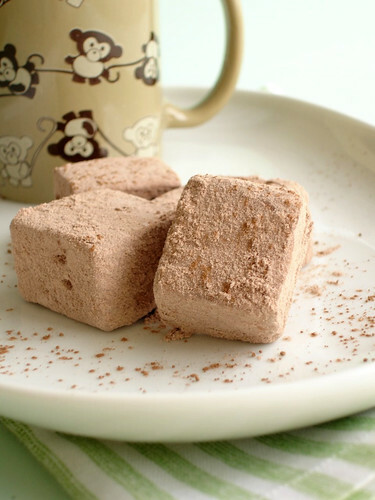 I've never made homemade marshmallows before, but I love marshmallows so I should try these! i love homemade marshmallow. beautiful! I love homemade marshmallows but have never tried the chocolate variety. These look just perfect for topping off a mug of hot cocoa! These look yummy, Patricia! What a great idea to add cocoa to the coating mixture. It should cut down the sweetness so well. I'm not a marshmallow lover, but I'd love some of these heavenly treats. Yours pics keep getting better and better, Patricia! I have to try these! 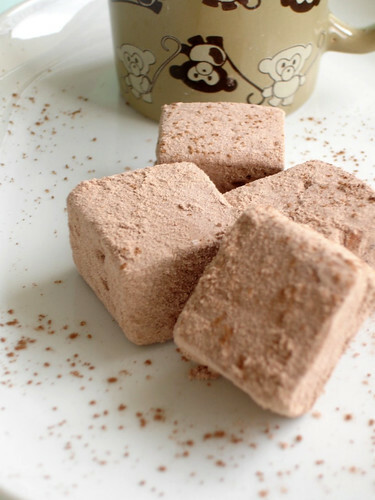 I have yet to try homemade marshmallows, but I think the coming cold and the fact that these are chocolate make it time! yay for nicholas sparks! yay for north carolina! (i'm not biased at all. ha.) read the book - haven't seen the movie - yet. i've had homemade marshmallows on my to-do list forEVER. yours look wonderful! I'm not yet tackled marshmallows, but I'm inspired by your lovely, delicate ones. Damn girl, that looks so much better than the chocolate marshmallows we got from Williams-Sonoma! Great job!